DescriptionCline Observatory on the GTCC campus is open for free telescopic views every Friday night (weather permitting), beginning at 7:00 p.m. For information, visit www.gtcc.edu/observatory or call 336-334-4822 ext 2620. There is no charge for public night viewing and the observatory is open to anyone wishing to attend. No reservations are necessary, and there are no limits on the number of attendees. According to the definition of supermoon coined by an astrologer, Richard Nolle, over 30 years ago and popularized only in the past few years the next supermoon comes today, January 30, 2014. It’s the second supermoon of this month, and it’s a new moon, not a full moon. The first new supermoon (super new moon?) of this month was January 1. According to Nolle’s definition, the year 2014 has a total of five supermoons. They are the two new moons of January, and the full moons of July, August and September. We’ve heard people call this second new moon a Black Moon, but that name doesn’t come from astronomy either. Like any supermoon, the January 30 supermoon will have an effect on Earth’s oceans. Expect large tides. We won’t have a single calendar month with two supermoons again until January 2018. 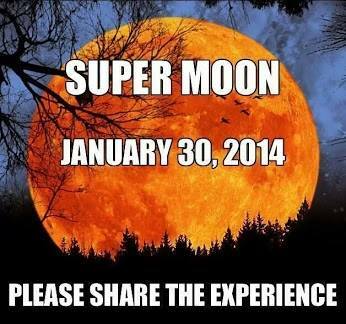 Follow the links below to learn about the supermoons of 2014. How many supermoons in 2014? Spring tides accompany January 2014′s supermoons. What did astronomers call these moons before we called them supermoons?